Does Moseley allow me to add on different delivery methods to my course? Some Schools only offer an online course. Why does Moseley offer so many different delivery methods? Am I required to spend 63 hours online or in a classroom? What if I miss or want to retake a classroom session? May I transfer my course tuition to my spouse? What does it cost to retake Moseley’s final exam? Why does Moseley only offer real estate career courses? Why is Moseley’s “First Time” pass rate so important? Why does Moseley have so many more classroom locations than all other real estate schools? Why does Moseley offer courses at real estate firms instead of hotels or office space? When does my tuition expire? When and where do I take my Moseley final exam? How flexible is Moseley’s salesperson course refund policy? What are Florida’s requirements to become a real estate salesperson? With Moseley’s flexibility and value-focused policies, why would I ever choose another school? Absolutely! Unlike other schools, Moseley offers course add-ons of your choice to ensure that you have access to the best tools possible in preparation for your final exam. Most other schools, if they even have multiple delivery methods, will not allow you to simply add these options and will charge you full tuition again if you need to adjust your delivery method. Moseley believes that you should have the delivery method flexibility you need to ensure your success! Student convenience and flexibility! Moseley has developed flexible options to provide for different learning styles and changes to busy schedules. Other schools either have only 1 option or charge you full tuition every time you need to make an adjustment. Moseley is dedicated to providing the most flexible and effective learning tools to ensure your success! Florida regulations state that any course completed through distance learning shall be completed once the student has read through the course material and passed a timed final exam. A classroom course must not exceed 63 hours of 50 minutes each with completion of a timed final exam. However, a student cannot satisfactorily complete the classroom course with more than 8 hours of absences. What if I miss or want to retake a class session? There is a $25 fee for any alteration made to a course schedule. But, don’t worry! Moseley will work with you to help you complete the in-class sessions and continue on the path to licensing success! Some providers charge the entire tuition again, but Moseley values the importance of fully understanding the course content and would never restrict make-up sessions. Absolutely! In fact, you can transfer your tuition to not only your spouse, but to anyone! Other schools charge a fee to transfer your tuition to another person and some do not allow it at all. Moseley’s flexibility ensures that your tuition is never wasted, should your situation change. There is no additional cost! The Moseley final exam can be attempted again for FREE. Most real estate schools charge a fee every time you retake their exam. We believe that having the flexibility to take our final exam as many times as necessary is an important element in your success with passing the FL Real Estate Licensing exam the first time. To guarantee that our expertise and commitment is exclusively focused on real estate professionals and their success! Unlike many other schools that spread themselves thin with courses for multiple professions, Moseley works hard to ensure that we have the best and most accurate real estate education information. Your time and your money! Moseley has designed our course content to focus exclusively on topics tested on the Florida licensing exam. Other schools re-sell a single national textbook, leaving you to sift through irrelevant information. We take our superior “first-time” pass rate seriously and use it to evaluate the success of our course material. Student convenience! Moseley has worked hard to provide as many convenient locations for our students as possible. Most schools only have 1-3 locations in a centralized area. With Moseley, you can travel across the state and there’s still a convenient Moseley classroom location near you! A superior student learning environment! Moseley has successfully partnered with the best real estate firms in your area to provide a learning environment in an actual working real estate facility. Unlike other schools that are tied to one real estate franchise and have various motives other than ensuring the success of their students, Moseley is not affiliated with any one firm or franchise. It’s important to Moseley that our students receive the full experience and familiarity of the real estate profession through a variety of real estate offices. Moseley allows students up six months to finish their courses. At other real estate schools, your tuition may expire in as little as three months, forcing you to pay full tuition again. With Moseley, your tuition remains valid for 6 months with an option for tuition extension (for a minimal fee), should you require additional study time. Whenever and wherever it’s convenient for you! Only Moseley allows the flexibility to take your final exam on your schedule and at your chosen location. Other schools will schedule the final exam at the end of your last class or after a set length of time, whether you’re prepared or not. 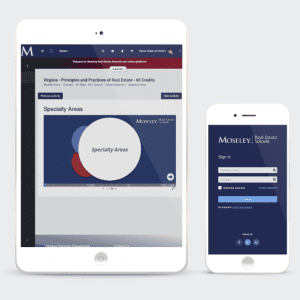 Moseley understands that every student requires a unique time-frame to complete the course and would never require a student to attempt a final exam for which they do not feel prepared. Your Moseley tuition is 100% refundable, for any reason, if requested in writing (mail, fax, or email) within 10 calendar days of payment or prior to the first day of your classroom session, whichever comes first. All textbooks must be returned in re-sellable, like-new condition or the cost will be deducted from the course total (current editions/versions ONLY). Refunds for online courses will only be given if the student has not yet begun the online course. -Pass the FL real estate state licensing examination. To learn more about Florida Real Estate Sales Associate licensing requirements, visit the Florida Real Estate Commission. Well, we hope you never do, but Moseley is always interested in feedback. We’re ready and willing to improve our materials and systems to best fit the needs of our students. Please send all comments and suggestions to feedback@moseley.org.